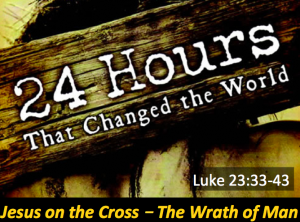 During the final 3 hours Jesus is on the cross, Jesus experiences the wrath of God. What does that mean? What happened? Why is it important to me? This Sunday, we will finish our series about the last 24 hours of Jesus’ life. In his last 3 hours on the cross, a cosmic transaction was made on our behalf. Jesus became sin and was punished in our place. We hear those words a lot in church, but what do they really mean? How did it happen? Why did it happen? To prepare, read Mark 15:33-41, Matthew 27:45-56, Luke 23:44-49, John 19:28-30, and Psalm 22. Thanks to Mike and Tasha Hasty for opening their home to us last Sunday after church and for all the great food everyone brought!! During the first 3 hours Jesus is on the cross, we see several interactions with people around him. In these, we continue to see evil and injustice, but also God’s glorious love. This week, we will continue looking at the last 24 hours of Jesus’ life. We are now with him on Golgotha- the site of his crucifixion. He will be on the cross for six hours. Sunday we will focus on the events that occur in the first three hours– a time one theologian has called “The Wrath of Man.” In spite of the pain, the evil, and the injustice, Jesus does incredible things. To prepare, read Luke 23:33-43. You should also read Matthew 27:35-44, Mark 15:24-32, and John 19:18-27. Many thanks to Dallas Stamper for preaching the last two weeks while we were visiting family and Michael Hasty for setting up the church. We will have a potluck lunch after the service at the Hasty’s house. Bring something to share (if you can!) and join us.